Offering relevant and market-responsive curriculum are hallmarks of a successful higher education division, no matter who you are or who you serve. But launching new courses or programs often involves lots of paperwork, many players, and strict approval dates that could be months or even years away. Of course, your students don’t really care about the obstacles that block a new program offering getting to market. All they want is access to relevant courses offered in a modality, timeline, location and price point that works for their unique needs. So how do you square this circle? What does it take to move through the important approval and feedback processes, but in such a way that the offering gets to market as quickly as possible? First, it’s critical to invest in a system that allows for more automation and reduces the bureaucratic reliance on paper being physically delivered from person to person. Looking at the example of getting new offerings launched quickly, automated workflows streamline the approval process to ensure that new or modified offerings are automatically routed to the right people at the right time. This means all the necessary people can review and approve offerings while ensuring nothing slips through the cracks. What’s more, by automating the course approval process, you are no longer tied to specific dates, so you can get new courses up and running any time without having to wait for the next semester. Secondly, institutions need to be able to efficiently unbundle and repackage offerings in multiple ways to cater to different learner requirements. After all, as any experienced higher education leader knows, completely different demographics and markets often want access to the same learning materials—but their needs and expectations are completely different. While defining multiple instances of a course as sections with specific start and end dates is common, it is important to go beyond this. You need to be able to price each section uniquely, all the way from free options to including specific discounting and pricing options. You need to be able to deliver different sections in any modality, with unique prerequisites and grading rubrics depending on the target audience for the specific section. Further, you need to be able to include sections in different certificate and maybe even degree packages, providing even more flexibility. 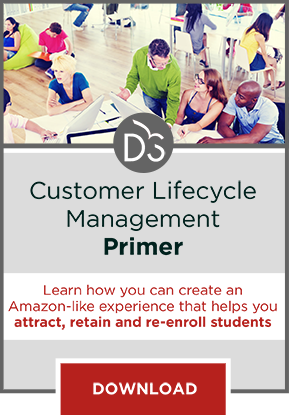 Learn more about Customer Lifecycle Management Systems, and their capacity to improve efficiency and accelerate the time-to-market for compelling curricula by downloading this primer.